Since Great Pyrenees were bred to guard livestock, this trait was useful in the Pyrenees Mountains for keeping large predatory birds away from vulnerable lambs and kids. Thanks to Snow, our gibbons will always be well protected from crows! Snow is a white Great Pyrenees rescue dog. She was born on February 28, 2008. When she was three, her owners, who had kept her outdoors chained by the waist, took her to the pound in Seneca, South Carolina. 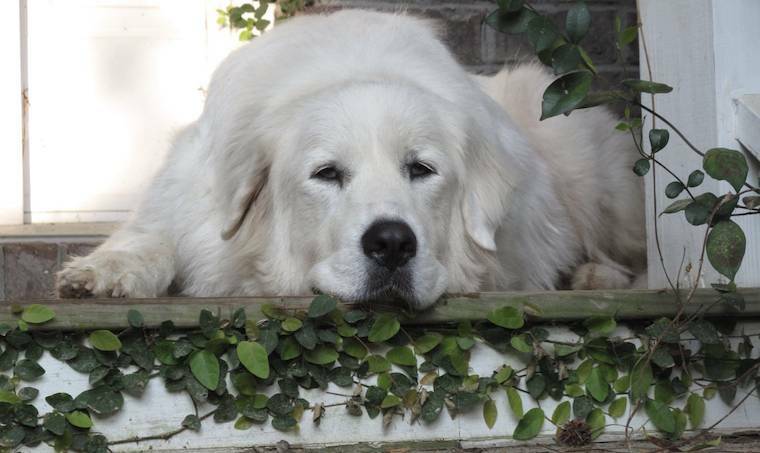 She was rescued from certain death by our friends at Carolina Pyr Rescue. She was treated for heartworms and placed in a foster home for socialization. 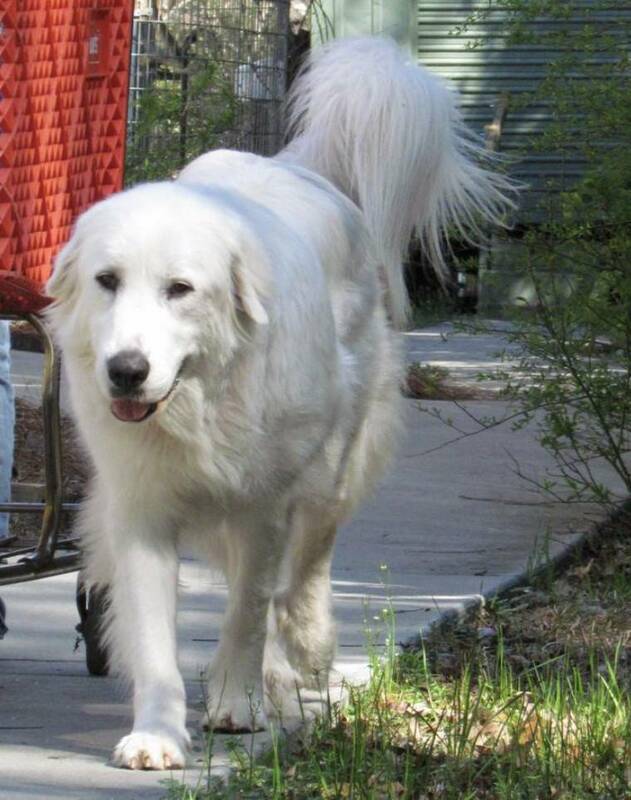 IPPL was anxious to have another Pyr to succeed our earlier Pyrs, Patou, Ivy, and Zoe so contacted Martha Rehmeter who selected Snow for us. She reached IPPL on January 13, 2011. Snow is a sweet and lively dog who loves chasing squirrels. She settled down well into the routine here and frequently accompanies our caregivers on their rounds. She likes to chase delivery trucks! Snow has the habit typical of her breed of barking at large birds. Since Great Pyrenees were bred to guard livestock, this trait was useful in the Pyrenees Mountains for keeping large predatory birds away from vulnerable lambs and kids. Thanks to Snow, our gibbons will always be well protected from crows! She is a great friend of Blue our black Newfoundland. She is 11 today and we hope she'll have many more years with us. She is a loyal faithful member of the IPPL family.